Buddhist in India flourished as early as 3rd Century BC till the end of 9th Cen AD. 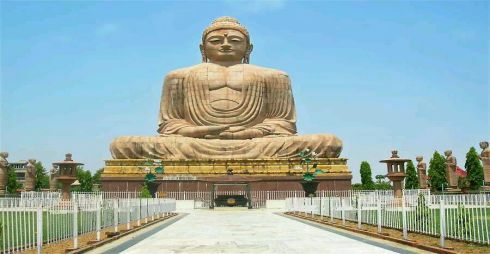 There are many places in India associated with Buddha directly or indirectly here we have selected those places which are major pilgrimage centers of Buddhist. Though you have the flexibility of customizing the tour itineraries as per your requirements depending upon the number of days you have. Upon arrival met & Greet at the airport by us. Thereafter transfer to your pre-booked hotel. Breakfast PM: We will visit to Qutab Minar, Raj Ghat by Pass India Gate, Presidential House, Parliament House then Akshardham Temple. New Delhi - the capital of modern India. Many dynasties and rulers flourished on its royal ground over the past 3,000 years. After breakfast proceed for sightseeing of Jama Masjid, Red Fort, Bhai Temple (Lotus Temple). Retunr to the hotel. Later in the evening transfer to railway station to board the train to Varanasi. Overnight on the train. On arrival at Varanasi met by our representative and transfer to hotel. Check in and later departure for Sarnath, where Buddha preached his first sermon after enlightenment. It was here that he proclaimed the four noble truths and the eightfold path. Examination of the remains of monasteries built in the third century BC, the legacy of the once thriving monastic community. Visit to Sarnath ASI Museum and Bodhi Statue. Return to the hotel for overnight at the hotel. Early morning before sunrise, about 5:00 in the morning you will go to a boat cruise on the Ganges. Meeting of dawn to the sound of the bells and shells, which is reached by services in the temples, situated on the coast. Return to hotel for breakfast. After breakfast drive to Bodh Gaya, on arrival transfer to hotel check in this is the place where the Buddha attained enlightenment at the age of 29. Boddhi Tree under which Buddha sat, is still there. Visit the Mahabodhi Temple, Niranjana River and Sujata village. Overnight stay at Bodhgaya. Post early breakfast drive to Patna en route covering the sightseeing of Rajgir- the seat of Lord Buddha & Mahavir for many years. On arrival visit to Jarasand Akhara, Vulture Peak or Gridha kuta –the favourite place for Lord Buddha for meditation and the site of some important discourses. Here is also Venuvana - the site of the monastery built by King Bimbisara for Lord Buddha's residence. Continue your journey and visit to Nalanda the oldest most organized and disciplined university for higher learning with courses available for almost every field be it astronomy, science, medicine, metaphusics, philosophy, Samkhya, Yoga Shastra, the veda and scripture os Buddhism. Nalanda, 10 km from Rajgir known for its monastic university, which at one time played a central role in the development of Buddhism in India, its development is the fact that it had an enrollment of 10,000 students in 2000 under the supervision of teachers. Arrival at Patna check in & overnight at the hotel. After breakfast proceed to Kushinagar en route sightseeing of Vaishali. Vaishali was the capital city of the Licchavi, one of world's first republics, in the Vajjian Confederacy (Vrijji) mahajanapada, around the 6th century BC. It was here in 599 BCE the 24th Jain Tirthankara, Bhagwan Mahavira was born and brought up in Kundalagrama in Vaishali republic, which makes it a pious and auspicious pilgrimage to Jains. Also Gautama Buddha preached his last sermon before his death in ca 483 BCE, then in 383 BCE the Second Buddhist council was convened here by King Kalasoka, making it an important place in both Jain and Buddhist religions. In commemoration of the Emperor Ashoka one of the pillars with lions has been erected here. Continue your drive to Kushinagar. On arrival hotel check. Overnight at the hotel. After breakfast visit the stupa and the temple of Nirvana with a 6 meter high statue of Buddha, dating back to Vth century BC. Then departure to Lumbini. One of the most important places of pilgrimage for Buddhists is Lumbini, located in Nepal close by India border. This is where the royal family was born as Prince Siddhartha Gautam. Emperor Ashoka has built the famous Ashokan Pillar. Then visit to Maya Devi Temple believed to be located on the same spot where Lord Buddha’s Mother Maya Devi gave birth to Buddha, an important reminder of the birth place of Buddha. Upon arrival transfer to hotel. Overnight at the hotel. After breakfast visit to Sacred Lake Pushkarni, Buddhist temple, and departure for Shravasti. With the VI century BC to VI century BC Shravasti was the capital of Kosala kingdom. Tradition says that Buddha spent 24 seasons here. Upon arrival transfer to hotel. Early after breakfast & quick sightseeing of Mahet Sahet.- Saheth-Maheth together with adjacent sites-Orajhar, Panahiajhar and Kharahuwanjhar the earliest references of the city are available in Ramayana and Mahabharata as a prosperous city in the kingdom of Kosala. Panini in his Ashtadhyayi makes a mention of Kosala while Pali Buddhist literature also makes numerous references to Kosala, its history and society. In the Puranas, it is described as the capital of North Kosala. It is said to have derived its name from a legendary king Sravasta. Drive to Lucknow Railway station to reach on time enabling you to board the Intercity train leaving at 3:30 PM. On arrival Agra Cantt Railway station received by our representative & will be transferred to you hotel. Overnight at Hotel. In the early morning take a sightseeing of sunrise tour of Taj Mahal- (TAJ MAHAL REMAIN CLOSED ON FRDAY) the Epitome of Stone built by Emperor Shah Jahan in the fond memory of his beloved wife Mumtaj Mahal. Return to the hotel. Breakfast & check out drive to New Delhi visiting Agra Fort-The Huge Fort just 2.5 kms away from Taj Mahal. The Fort can be described more accurately as walled city. Continue to your journey to Sikandra Fort- The Mausoleum of Emperor Akbar. Reach New Delhi hotel check in & overnight at Hotel. Transfer to the New Delhi International airport for onward flight. There are regular power cuts in Bodhgaya, so it's a good idea to carry a flashlight with you. Both vegetarian and non vegetarian food is available in Bodhgaya, and there's a wide range of cuisine from Thai to Continental. The Be Happy Cafe offers delicious vegetarian pizzas, baked goodies, salads, and proper espresso coffee. There's even wireless Internet. Understandably, it's a favorite with travelers. The makeshift tented restaurants that line the roadside are also interesting and inexpensive places to eat. You'll find plenty of meditation and Buddhism courses and retreats on offer in Bodhgaya. The Root Institute for Wisdom Culture offers introductory and intermediate meditation and philosophy courses, explained in the Tibetian Mahayana tradition, from October to March. Those interested in Vipassana Meditation can learn it at the Dhamma Bodhi Vipassana Centre. Ten day residential retreats start on the 1st and 16th of every month. Some monasteries also offer various Buddhism courses. The biggest festival in Bodhgaya is Buddha Jayanti, held on a full moon in May each year. The festival celebrates Lord Buddha's birthday. Other festivals in Bodhgaya include the annual Buddha Mahotsava, a three day celebration filled with cultural and religious activities. The Kagyu Monlam Chenmo and Nyingma Monlam Chenmo prayer festivals for world peace are held around January-February every year. The Maha Kala puja is conducted at monasteries for several days before the new year, for purification and to remove obstacles. A stay in one of Bodgaya's monasteries is a peaceful alternative to a hotel. One of the best options is the well maintained Bhutanese monastery (phone: 0631 2200710), which is extremely quiet and has rooms located in a beautiful garden. It's also possible to also stay at the Root Institute , which is well located near the Mahabodhi Temple and offers meditation retreats. If you'd prefer to stay in a hotel or guest house, Kundan Bazaar is very popular with travelers. It's located in the quaint village of Bhagalpur, a five minute bicycle ride from the center of Bodhgaya. Hotel Taj Darbar is the pick of the top-end hotels, and it has a convenient location near the Mahabodhi Temple.